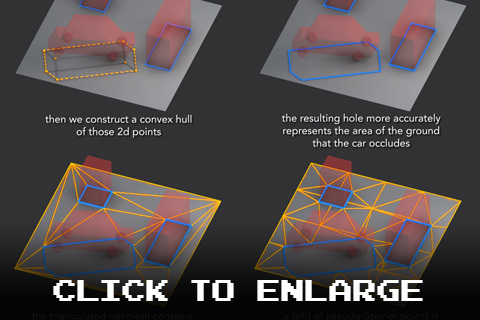 Here is a short illustrated write-up explaining how navmeshes are generated per-tile in Zombox. The illustration also demonstrates how non axis-aligned obstacles are handled. Hey Tyson, just wondering what’s left to be implemented into Zombox. I am extremely exited for when this game is officially released! I even got a lot of my friends exited for it as well! Hmm, the only thing I can think of that would improve the result would be merging points that are really close, when possible, though that would probably be of marginal benefit. Powered by WordPress v 3.4.2. Page in 0.154 seconds.